There are three hill ranges grouped around the town of Blaenau Ffestiniog in Snowdonia, to the north-west, west and east. They formed the target of ‘my first wild camp’ (aged 62) in 2013, though I’d climbed one the year before. 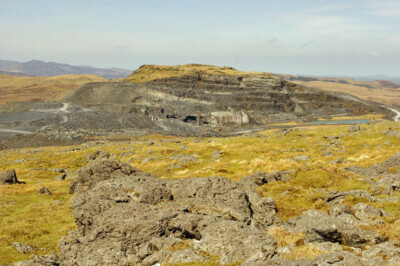 Blaenau is an industrial town, and as well as great mountain scenery many of the hills bear testament to the area’s continuing mining and quarrying traditions. The day after climbing Mynydd Mawr, I took the Sherpa bus from Rhydd-Ddu to Bethania in Nantgwynant and set off for the hills south of Llyn Edno. 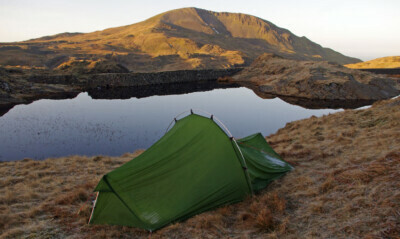 I wild camped before completing the Moelwyns later that day – see below. There’s a mile on a quiet lane from Bethania before striking out past Hafodydd Brithion and taking the path up to Llyn Edno – easier to follow higher up than lower down, I remember. Here, turn south on the three-topped ridge of Ysgafell Wen – the highest is the last, at 2204ft, but the finest view is perhaps between the first two where the tiny Dog Lakes have formed in the depression. From here, Moel Druman (2218ft) is only half-a-mile away, and my wild camp spot, near Llyn Cwm-corsiog, the same distance further on. I just made sure I kept out of sight of a couple of farmworkers on their quad bikes, which I had seen earlier. The gods were certainly smiling on me as the day had been growing sunnier and, as I pitched, a beautiful afternoon was in prospect. 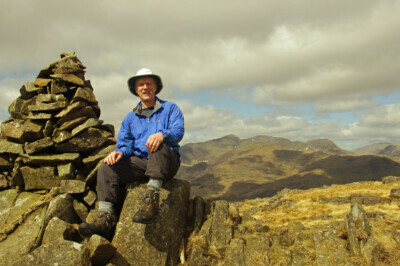 Moelwyn Mawr, the king of the group at 2527ft, is a peach of a hill and from my camp I had a wonderful view of it. Old mine workings around Llyn Croesor lay between but added to the interest – though continuing agriculture meant that I found out for the first time what an electric fence feels like. I took the hill by its north ridge, a pretty unrelenting 600ft; I was glad the tent and all the bits that go with it was no longer on my back. 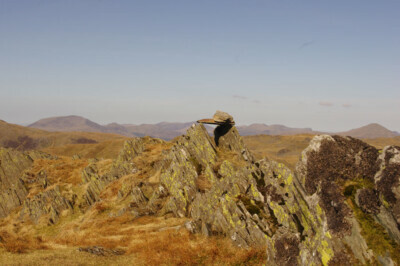 It’s linked to Moelwyn Bach (2334ft) by a ridge that drops down to a saddle just below 2000ft. There are plenty of crags to avoid and I was glad of the good visibility, as well as having recently ascended Bach when it came to descending it by the same route. From the saddle there’s an entertaining path which contours above Llyn Stwlan. The final hill of this group, Moel-yr-Hydd (2124ft), is a simple climb in comparison to the two Moelwyns and I was soon back at base. There’s one other hill in this group, Cnicht (2265ft), which I had climbed the year before while at Rhydd-Ddu, using the Welsh Mountain Railway to do so! There’s a halt at Nantmor, from where a mile of minor road takes you into Nanmor (sic) valley and a lane tracks over towards the village of Croesor, usual starting place for the climb. However before dropping down to the village I cut off NE onto Cnicht’s famous ridge, which rises increasingly steeply to the summit; there’s even one small scramble, which was hosting a youth group in descent as I arrived, hence a useful guide to route finding. Alas the day was a little damp but I still enjoyed the views from the top over the estuary, Porthmadog and the sea. For return, I simply reversed the route, in good time to flag down the train ‘home’. To add a bit of interest to summits that are regarded as ‘for completists only’, I came at this group from my wild camp in the Moelwyns – a cold, sub-zero night which dawned with a beautiful blue sky that never clouded. Not far above me was Allt Fawr (2287ft), a lovely little hill which is in essence the last and highest of the ridge that started on Ysgafel Wen. From here I dropped down to the Crimea Pass and set off on the round of the three Ffestiniog hills. The way to the first, Moel Penamnen (2044ft), however, was no longer clear, with a new fence and a mountain-bike route changing the mapping. I found a way up from the car park just north of the pass, and got back on track after crossing the shoulder of Moel Farlwyd. From the hill there’s a squelchy mile south to a quarry road, and then it’s a case of finding a way through the barbed wire fence guarding the north top (2159ft) of Manod Mawr. I found a stile at 728461, but not before snagging my top a couple of hundred yards before. There is active quarrying here still, indeed little of the north top remains, but the main top (2268ft) has fared a little better. From the latter, it’s a case of finding a way down to Llyn y Manod, which I managed by a steep grassy rib. The fleshpots of Blaenau Ffestiniog are then soon reached. I booked into my B&B, and turned back into a tourist.